Let’s talk tack, shall we? A fun conversation with Karen this past weekend has me curious about others’ riding boots and saddle pad collections. How many pairs of riding boots do you own? Do you have riding boots reserved for shows only? I have 3 pairs of boots: 2 pairs of tall boots and 1 pair of paddock boots. One pair of tall boots are old Effingham field boots that I’ve been meaning to donate/give away (size 9, extra wide calf – any takers?). The other pair are Ariat field boots which formerly were my show boots, but are now my everyday boots. I used to ride in paddock boots and half-chaps, but my half-chaps’ stitching came undone (and they’ve been in my car for like 2 months waiting for me to get them dealt with) and in the meantime the show boots became daily boots. How many saddle pads do you own? Do you have saddle pads reserved for shows only? I have close to 15 saddle pads, a few of them are dressage pads but most are all-purpose. I reserve 2 pads for shows: a white dressage pad and a black jump pad. All the others go through my normal rotation of use. I LOVE saddle pads. They’re always on my Christmas and birthday list, and I gratefully collect them from friends. I like having a stack of clean ones available at all times. As you can tell from the below stack, I seem to have one from every different manufacturer! Please share about your boot and saddle pad collections, or whatever other tack you collect! I'm down to 2 pairs of tall boots – a schooling pair (brown) and a show pair (black). A couple months ago I had 4 pair so I feel like I deserve a cookie for downsizing. 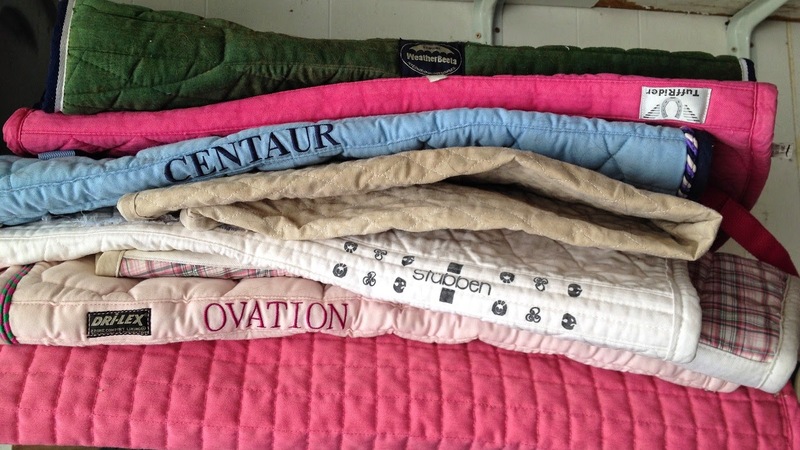 As far as saddle pads, I have a major custom baby pad obsession, I've got about 10. And then one that is reserved just for shows, although to be honest I don't like it that much anyway. You can never have too many pads! I don't show, so I don't have anything to reserve, although I do keep certain things for when I take lessons and etc. I have three pairs of riding boots, one just for the trails, one for winter and one just as a spare pair that I don't use as much because the rounded toe is too large for most stirrups. As for pads, I have 3 western pads that I use (I did have more but then I got a heavier saddle and I have to use built ups for it) and I have two english pads, one is stained that I just use whenever and the other one is my main pad. I plan on buying more English pads when I pay off my dressage saddle. I have a pair of paddock boots and a pair of tall boots reserved for shows( haven't needed them yet but I want to keep them nice). I only have one pair of paddock boots that I use for both schooling and competition – I hate tall boots and have a hard time riding in them. As for saddle pads, I have about 5-9 English pads with 2 reserved for shows and I have 3 western saddle pads with 1 reserved for shows. Dead Ariat paddock boots/half chaps I despise but used this summer while waiting on my La Mundials. Saddle pad wise… I have so many. I have a bunch of unused dressage pads now :( though I think I'll hang into them because I see myself wanting a dressage saddle again when I can save up for one I really like. I'm obsessed with the ogilvy baby pads so I'm trying to downsize my collection and replace with the ogilvy pads. I figure my older saddle pads will be good for my dogs crate maybe. Or I'll give them to someone. :) good post! I school in paddock boots and show in tall boots. I'm too poor to buy any more than that, and my tall boots are so cheap they'd never stand up to every day schooling anyway. I school in paddocks/half chaps and have yet to use the tall boots I bought for shows last fall. I have 22 schooling AP pads (4 are new, never used), 4 schooling DR pads and 1 show only pad for each Hunters and Dressage. Plus 5 half pads (FW, Mattes, Ogilvy). Yeah… Did I mention I have 1 horse? Love it, Sarah! I can't wait to check back!!! I did a quick count … I have two pair of tall boots (one for showing) and a pair of paddock boots (and a few pair of Ariat terrains for trail but I didn't count them). Remember the saddle pad count? I actually do have more than 16 pads although at least 4 of them are for trail and endurance and don't get used very often. I also have at least 4 show pads, and maybe 5. I am very curious as to what everyone else has! I had to do a lot of mental counting on the saddle pads, I've paired it down to 5 recently but I suspect I will be back above 6 in no time. :) Cool idea on the polls, I've always kind of wondered what other riders have for gear. I school in my Trentorn boots and show in Mountain Horse, but they aren't limited to showing only. I have about 30+ saddle pads. I have Ecogold Dressage, jumper, and XC pads, plus hunter pads that are saved for showing only, along with 2 Ogilvys that are kept bagged and clean! Clearly I need more saddle pads!! Omg. I just found and love this post. I just retired my pair of synthetic everyday tall boots (they finally fell apart at the foot), and have bumped my Mountain Horse show boots up to take their place as my show/schooling boots. So far, they are holding up well. I figure I'm super cheap so I better get my full money out of their use. ;) I stressed for a long while about not having a pair of dedicated schooling boots, but I think these will last okay. Right? Right? !